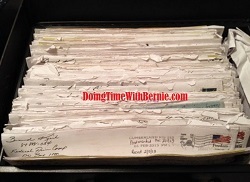 DoingTimeWithBernie.com: Felon Bernard Kerik Rumored Torrid Love Affair with NYC DOC Retired Captain Maritza Rosado is apparently over! Felon Bernard Kerik Rumored Torrid Love Affair with NYC DOC Retired Captain Maritza Rosado is apparently over! Felon Bernard Kerik Rumored Torrid Love Affair NYC DOC Retired Captain Maritza Rosado is apparently over! If you believe Facebook posts, then Retired NYC DOC Captain and former subordinate, Maritza Rosado, is done done done with her rumored lover, Former NYPD Commissioner turned felon, Bernard Kerik! If you believe, Facebook posts (and who doesn't?) check these out! No wonder Hala Kerik is kicking felon deadbeat Dad and Hubby Bernard Kerik to the curb!